Vivo V15 Pro Poster Leaked to Reveal Full Design - Playfuldroid! Vivo has recently confirmed that it will be holding a launch event in India on Feb. 20. The event will be used to announce the Vivo V15 Pro smartphone. Rumors have it that the Vivo V15 phone will be also announced alongside it. 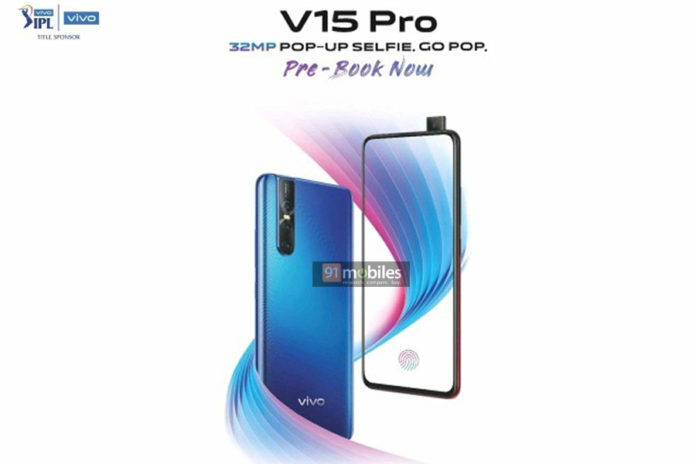 An Indian publication has leaked the poster of the Vivo V15 Pro smartphone. The poster confirms that the handset will be available for pre-booking in India from Feb. 15. The leaked poster reveals that it could be the first budget-friendly notch-less smartphone to land in India. The marvelous screen of the phone is embedded with an in-display fingerprint reader. Like the Vivo NEX phone, the V15 Pro will be featuring a pop-up selfie camera. The backside of the phone is fitted with a triple camera setup along with LED flash. It is speculated that the triple camera system of the V15 Pro includes a primary sensor of 32-megapixel. The rear panel of the Vivo V15 Pro is made out of glass. The handset sports a blue gradient color. As of this writing, there is no information available on the price tag of the V15 Pro. It is speculated that the handset will be costing between Rs. 25,000 ($350) and Rs. 30,000 ($420) in India. The Vivo V15 smartphone is may cost between Rs. 20,000 ($280) and Rs. 25,000 ($350). Rumors have it that the V15 Pro would be made available in China as Vivo X25.